As reported here, Royal Mail were not selling Post and Go Faststamps at the 30th Asian International Stamp Exhibition in Taipei in April, but International Security Printers did have a machine dispensing souvenir labels. 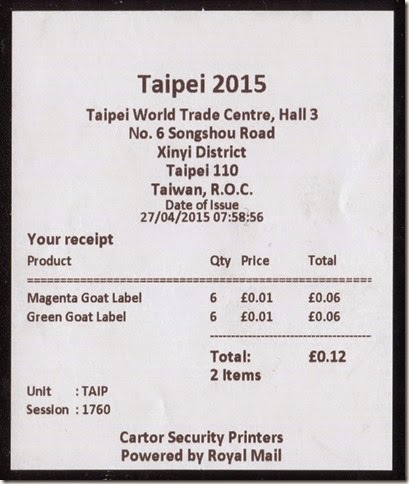 Of additional interest is the CARTOR caption on the goat, suggesting that these - and possibly our own Post and Go Faststamps - are printed not by Walsall in the UK as previously thought but by Cartor in France. 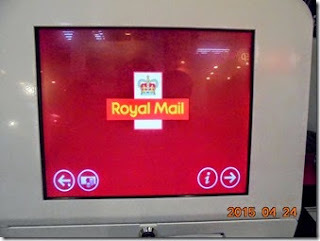 Maybe somebody can confirm which one of the International Security Printers factories actually prints for Royal Mail? Royal Mail have confirmed that although the labels advertise Cartor they were printed by the Walsall arm of ISP in gravure. Cartor do not have the capacity to print reels. 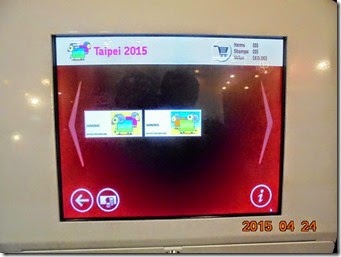 Thanks to George Wu of Taipei for sending more pictures including photos of the machine. George runs the Gulfmann ATM website, covering machine-vended postage stamps/labels from all over the world. 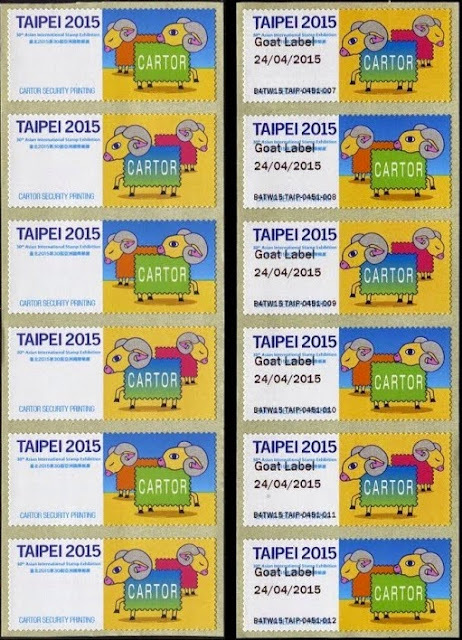 "France's Cartor Security Printing joined with British Royal Mail setting an exhibit booth at the 2015 Taipei Asian International Stampex from April 24 to 28, 2015. 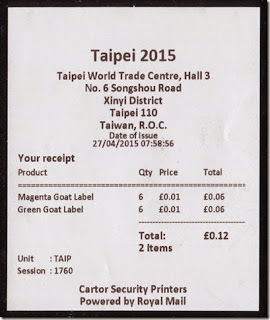 "Cartor provided specially printed self-adhesive commemorative labels (no country name and denomination), and the Royal Mail’s Post & Go Series II machine was public demo during all the five days from April 24 to 28, 2015. "It's a really new experience about the Post & Go system to all Taiwan philatelic collectors." Of course Post and Go are printed in gravure, and I suppose the quantity used in Taipei was more suited to litho and hence Cartor. However, it sets the imagination going regarding the possible future use of Cartor for short-run commemorative Faststamps!